I've been slowly trying to decorate each room in our rented 2 bedroom apartment. In our last apartment it felt like each room was decorated, but nothing was complete. So what I've decided to do know is focus on 1 room at a time. This is the first room that is completely finished. For all of you that rent like we do, it can be challenging to make your apartment feel like home. Even though we can't change flooring or tiling, I tried to make it as home-y as possible. 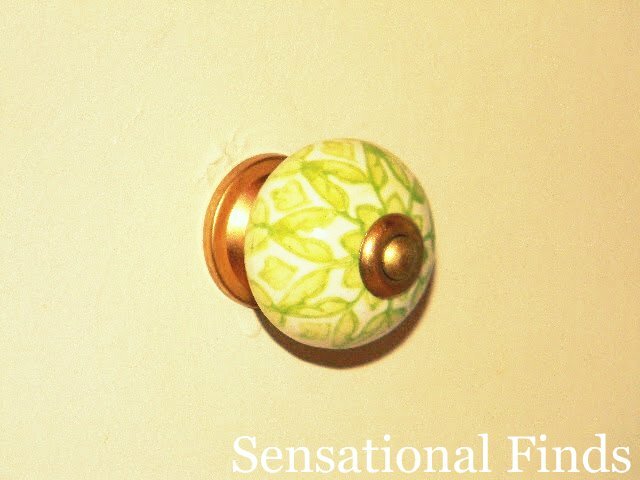 Here is what I did to add our own touch to our tiny apartment bathroom.. I wanted the space to feel clean and light with mostly silver and white accents. The paint is Olympic semi-gloss that I used in our living room. I had enough left over to use in the bathroom. I don't have the name of the color, but it's a grayish-blue. I found this jewelry holder at Marshall's for $14.99. I was going to make a necklace holder, but when I saw this I like it a lot. I really like that it has a door, but you can still see your jewelry. I even can keep my watch on the shelf. I showed you this shelf in a previous post, but this is it completely decorated. I added the friend sign and candle. I also moved some things around. 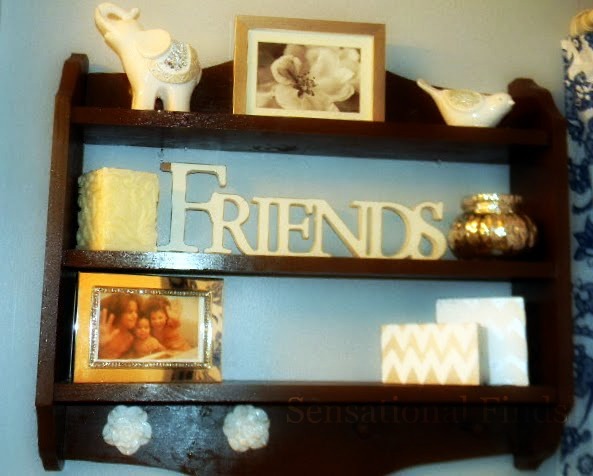 I love adding personal touches to any space. There's a close-up of the candle. I think it's a really cute decoration. These two things are really old, and I've had them forever, but they work well with the space. 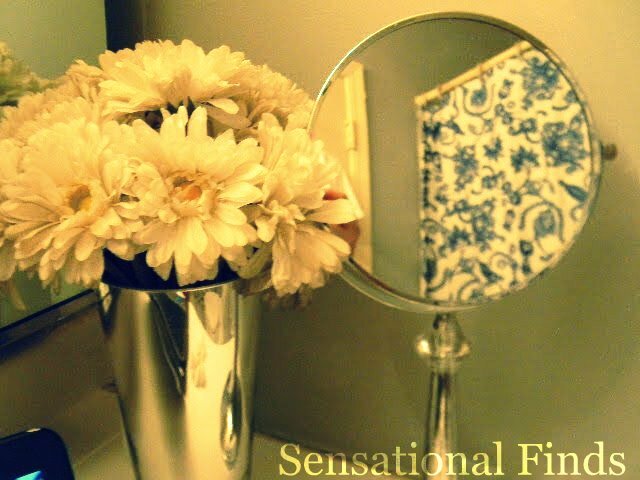 I love fake flowers, and have them in just about every room! The shower curtain is a recent purchase from Target and I believe it was around $20.00. The whole bathroom was decorated for about $100 and even though it was completely renovated (which I wish it had been), it's my way of adding the special touch to our apartment. I hope your having an amazing weekend! That is so pretty. 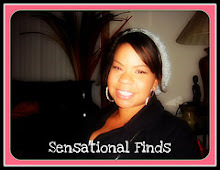 I am a renter too so I know how hard it is to make the space look personal. Good job! I love the shower curtain print looks great! Great job, Sarah! 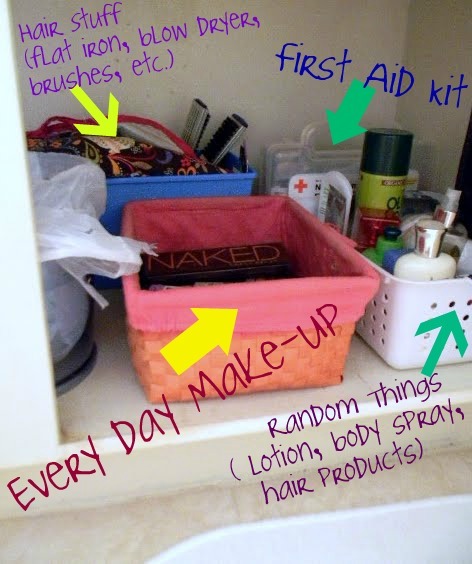 I love an organized bathroom. The jewelry holder is a great idea! 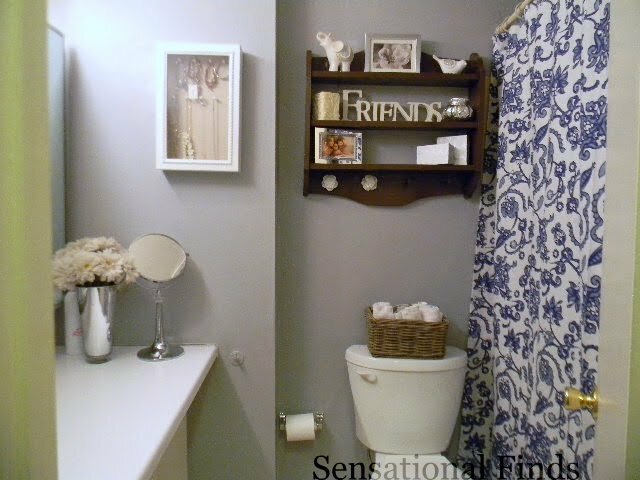 Your bathroom is too cute! I've been eyeing that same Target shower curtain. I love blue and white together. 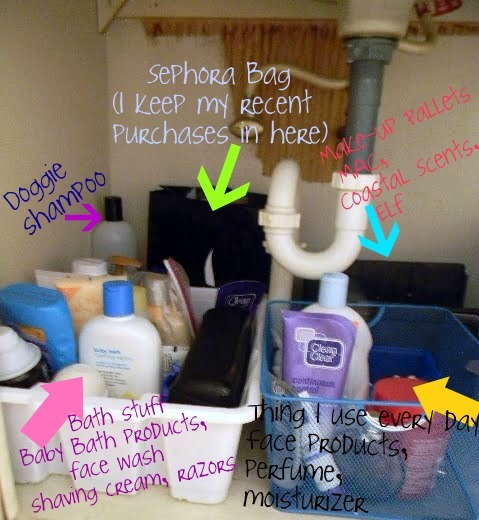 I noticed that I organize my bathroom supplies almost identical to the way you do it! Too funny! Following you now through Google! This is FABULOUS!!! I wish my bathroom looked that great! This looks great! Soooo much better than our bathroom (we rent too). I would love it if you shared this Fabulous Friday! You did a brilliant job! The new hardware looks gorgeous-well chosen! I know how you feel. I live in a rented condo, where I am told I can make changes but I have to put everything back. Knowing I am going to live here for 4 years, makes me hesitant to cause a lot of work for myself down the road. 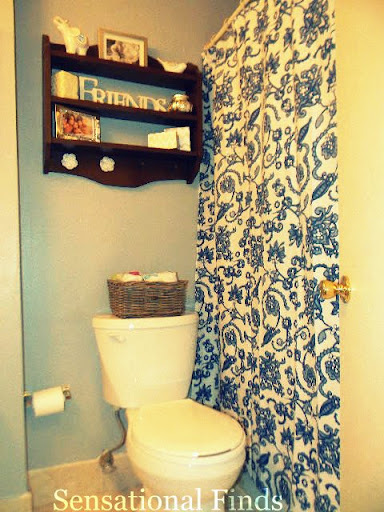 But, anyways I love what you did with your bathroom. It is always fun to see how another renter works within the confines of a rental property! looks great!! I love the colors. Found you on I heart naptime. ravelers Harbor is the perfect localise to conceptualize mellow degree, low expenditure corporate housing, volumed apartments and long-term rentals in Florida Keys. We utter preeminent accommodation for companies or individuals wanting to check for periods of 30 days or more. Our professed unit can regain the perfect prop for your needs with inactivity and it won't cost the ground. I wana thank you for providing instructive and qualitative stuff so often. this is so wonderful, I would never have the nerves to create as many invitations, even if it was for my own wedding! It looks fantastic! Thank you so much Admin, I came to this post and knowing about value of this post because your explaining way is awesome and you have shared everything. I appreciate your work and like it very much. Doing great work and keep it continue dear. Post new things related to 2018 updates. Looks lovely, I like the decoration ideas for such small room and all on a budget. 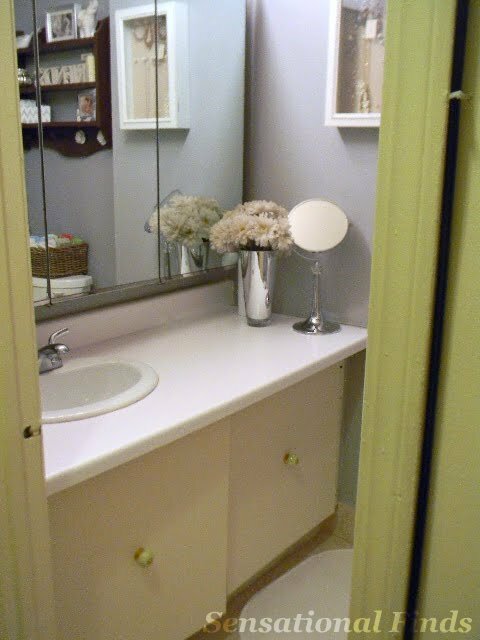 You may also like bathroom design aberdeen for ideas of small bathroom decor. It's all about space-saving storage and increasing your apartment's space. Great Article. Appreciate for sharing, looking forward to read more. The Kitchen drawer hardware also includes a wide variety of baskets, compartments and dividers for shelves, cabinets, drawers and other speciality items. Look for metal racks and finished with a vinyl, plastic or chrome coating for durability and resistance to rust.